EMOTIONS will flow like champagne if either Ruling Dynasty or High Midnight win today's Group Three Lexus Handicap (2500m) at Flemington to leapfrog into Tuesday's Melbourne Cup field. A win by either would mean the great two mile staying race would have a horse in the field trained by James Cummings, the grandson of the Melbourne Cup's Godfather, J.B. "Bart" Cummings, who passed away earlier this year. Bart won an unprecedented 12 Melbourne Cups, and to have a horse in this year's field with the Cummings name beside it in the race book would stir emotions even more than what is likely when the 100,000-plus crowd pays homage to the Cups King on Tuesday. Of the pair, last-start Randwick Tatts Cup (2400m) winner Ruling Dynasty is a $67 chance in Melbourne Cup betting, with his stablemate High Midnight a despised $601 outsider. Neither horse will make it into the Cup field unless they win the Lexus, which the betting suggests is a wide open affair. Ruling Dynasty is equal-second favourite at $6 with Gai Waterhouse's Excess Knowledge, just behind $5.50 favourite Havana Cooler, which is also trying to get into the Melbourne Cup by winning the Lexus. The Cummings name will ensure Ruling Dynasty, and for that matter High Midnight, have plenty of sentimental support from rank-and-file punters. 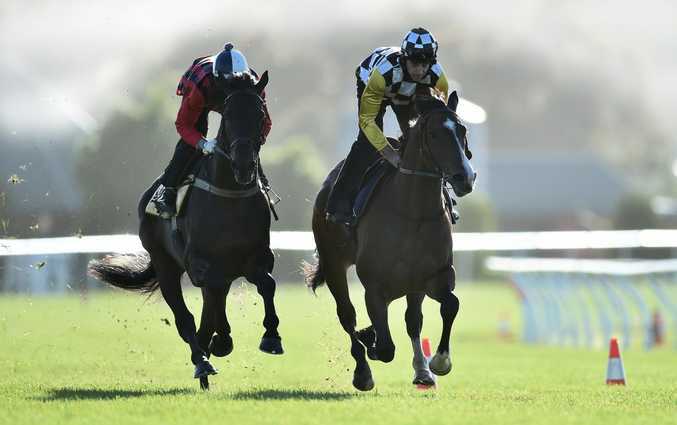 Havana Cooler will be ridden by in-form Kiwi hoop James McDonald, and the John O'Shea-trained galloper looks a stayer on the rise after an eye-catching third behind Magic Hurricane in the Group One Metropolitan Handicap (2400m) at Randwick on October 3. Placed up to 2800m in the UK, Havana Cooler has started only 13 times in his career for the powerful Godolphin stable, producing two wins and six minor placings. Apart from the son of Hurricane Run, O'Shea will try to get Magic Hurricane into the Cup by winning the $1 million Group One Mackinnon Stakes (2000m) this afternoon. The six-year-old is a $6 favourite in another difficult race for punters. Waterhouse will saddle up former import Pornichet ($8) after a solid fourth to Winx in last Saturday's WS Cox Plate (2040m) at Moonee Valley. After being scratched from the Cox Plate, the smart Contributer (James McDonald) also looks a solid chance if he can recapture his best form. Contributer looked a star in the making in the autumn when he won three straight in Sydney, lifting him to Cox Plate favouritism.